This style emerged in France in 1925 and quickly became an international craze. It has spread across decor, fashion, architecture and design and serves as inspiration for museum, hotels and even scenery in Hollywood films! The essentials of art decor include objects and decorative elements such as armchairs, wallpaper, frames, chandeliers, wooden furniture, mirrors, geometric and angular shapes and strong colours. 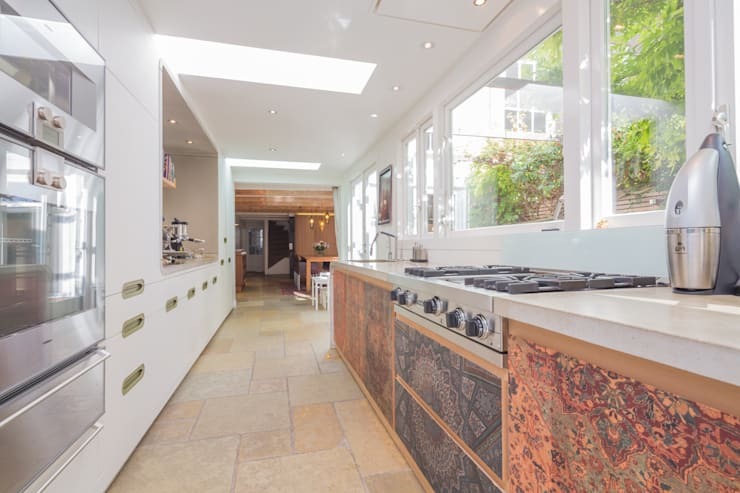 Inspired by this, today at homify we have put together six dashing kitchens. Each one of them is as inspiring and delightful as the last! Today's key words are glamour, romanticism, eclecticism and nostalgia. 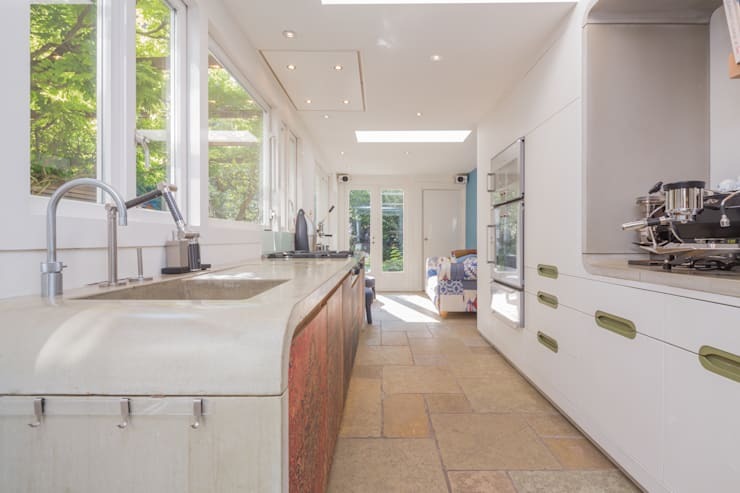 This kitchen is like a blank canvas, with touches of colour and personality. If you want this type of style, opt for neutral colours as the base including black, white and grey and then add contrasting shades like reds or browns or strong chromatic tones. The important thing is to introduce contrast, density and personality. Don't you love the red cushions and the patterned tiled walls in this kitchen? 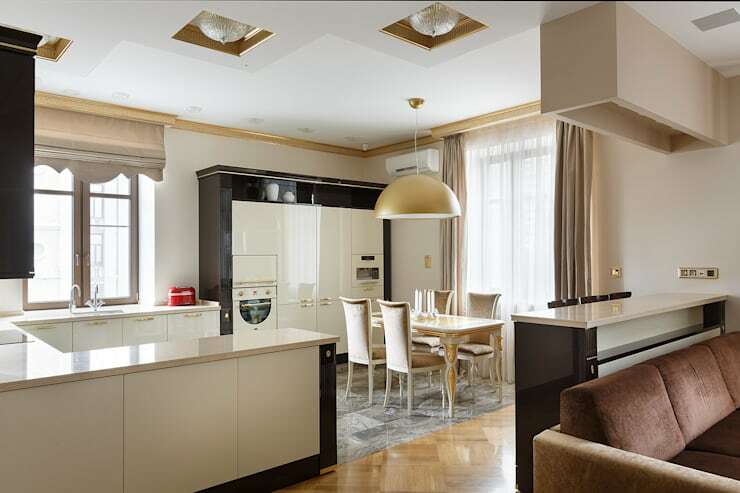 This kitchen references a 1920s style, but includes noble materials such as marble and ivory. 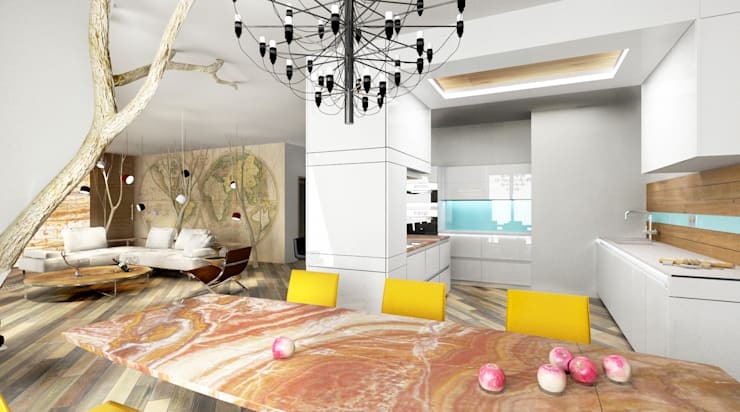 Strong colours in the form of decorative objects bring brightness and glamor to the environment. Our motto: get creative and use art decor style to introduce classic themes in a modern reinterpretation! This is a very elegant theme, where gold details work in harmony with the ceramic floor. 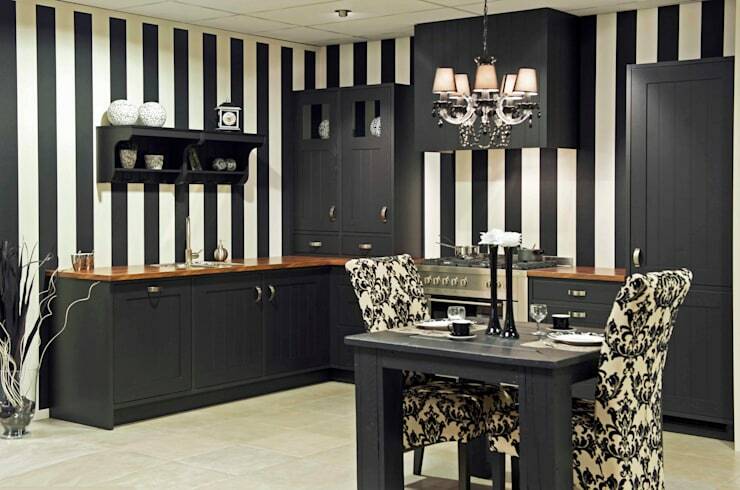 The black and white lacquered furniture makes for a beautiful finish! Another feature of art decor is the unique nature of every piece of furniture that we choose for the home. The emphasis is always on the decorative value! 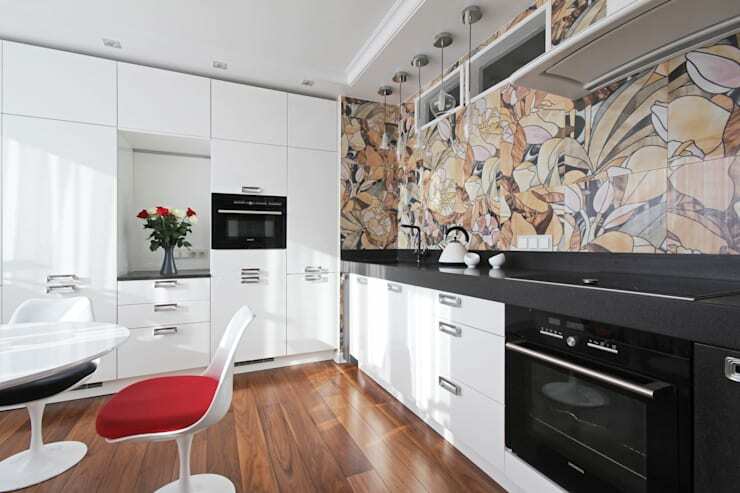 The kitchen is thus an amalgam of influences where every element shines! The glamor that we have described is present in every nook and cranny of this kitchen. Everything revolves around dramatic tones, reflecting a cosmopolitan lifestyle. The black furniture and striking striped wallpaper work in harmony with the velvet patterned chairs. This is class and drama all in one! The detail of the floor makes a huge difference when it comes to creating a stylish kitchen environment. 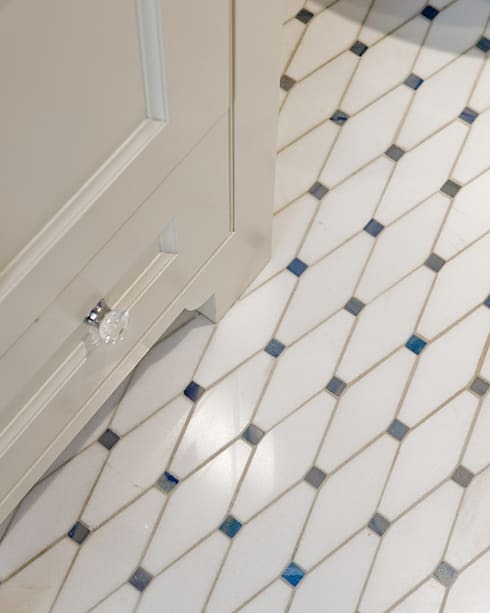 This ceramic floor is simple but very interesting and sophisticated. The art decor style looks luxurious with its geometric shapes and beautiful style. Pair with marble surfaces and you have an ideal cooking space! This long kitchen is designed to impress! Decorated with Persian style, it features a very unique personality and charm. Natural light is the star of the show, flowing in through the large glass windows and skylights in the ceiling. Have a look at this article for inspiration: Bright ideas: 10 naturally lit kitchens. Note the curvaceous finishes of the furniture and the stunning tiled flooring. If you like a more sleek look and feel, you may like these 10 modern minimalist designs. Are you impressed with this style?